Lawn aerating is a way to supply the soil with air by poking holes in the ground throughout the lawn using an aerator. As a standard lawn care, frequent aeration reduces soil compaction and helps control thatch in lawns, helping water and fertilizer move into the root zone. Never aerating in extremely hot and dry and aerating frequently in heavy traffic areas. The best time for aerating is when actual cores or plugs of soil are pulled from the lawn. Holes should be two to three inches deep and no more than two to four inches apart. 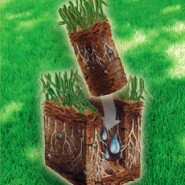 The day before aerating, you should thoroughly water the lawn to make sure plugs can be pulled more deeply and easily. 1. Improved air exchange between the soil and atmosphere. 2. Enhanced soil water uptake. 3. Improved fertilizer uptake and use. 4. Reduced water runoff and puddling. 7. Enhanced heat and drought stress tolerance. 8. Improved resiliency and cushioning. Late spring, around May is the best time to aerate and spread seed for warm season grasses, like Bermuda. Aeration and overseeding will be good for cool season grass, like rye in the fall, around September. If you want your lawn to be healthier, you’d better eliminate your thick thatch by aerating. Thick thatch will lead to lawn disease, over-population of insects and water deprivation, so aerating when it needs to provide a healthy environment for your grass to grow. Only when your lawn gets enough oxygen, water, fertilizers and nutrients can it keep healthy for a long. Aerating helps water to filter down through the soil to reach the root systems better and provides oxygen, fertilizers and nutrients to the root area. Aerating eliminates weeds such as crabgrass, providing enough water, oxygen fertilizers and nutrients to the lawn. So as a feature of unhealthy lawn, brown spots will never take hold with aeration. Maybe you are puzzled by your lifeless lawn. No matter what you do, your lawn just doesn’t turn green. Try aeration, if you have a lot of traffic in your yard.